Refuse trucks are built to operate in all conditions, so who can complain when a little rain dampens a test drive? Or when sheets of unrelenting, driving, torrential, cold, November rain, for that matter, soak through everyone who dared step outside? The trash still has to be collected, so there were no complaints from me when I visited Mack Trucks’ Customer Center to drive the company’s newest refuse truck, the LR model. In fact, the pouring rain helped me gain an appreciation for some of the subtler design enhancements built into the LR model that would otherwise have gone unnoticed. For example, a new drip rail above the door that keeps the rain from cascading into the cockpit every time the door is opened, which could be more than 1,000 times a day. The LR model brings to refuse truck operators amenities and creature comforts that were previously unavailable in the company’s LEU model, which the LR replaces. The LR was shown for the first time at last year’s WasteExpo show in Las Vegas and Canadian customers got to see one up close at this year’s Canadian Waste & Recycling Expo. It’s a comprehensive update, especially as it relates to two key areas: driver comfort and safety. In terms of comfort, an improved HVAC system featuring 16 vents offers better temperature control and window defrosting. Interior and exterior LED lighting is now offered. A new tilting/telescoping steering column provides greater operator comfort and the gauge cluster is mounted to the steering column to provide good visibility, whatever the position. The driver display is more modern, vibrant and colorful, making it easier to find at a glance the information you’re looking for. Power windows and locks are now standard. The mirrors can memorize two positions, which is especially handy when the truck is configured for left- and right-hand driving. A simple flip of the switch positions the mirrors exactly where you want them for driving from either side. The LR I drove was set up as dual sitdown configuration – seats, steering wheel and pedals on both sides. A toggle switch allows the operator to switch between modes while the vehicle’s parking brake is activated. The gauges and controls on the selected side light up, and away you go. Mack is seeing more demand for trucks with right-hand drive capabilities, so that operators can service an entire collection route on their own, according to Curtis Dorwart, Mack’s refuse product marketing manager. The LR now boasts a more vibrant driver display. The truck I drove was fitted with a Labrie Expert automated side loader body. When working the controls to pick up a blue bin, I quickly gained a new appreciation for refuse truck operators. Driving the truck is the easy part. Working the side arm controls – as intuitive and well designed as they are – is a learned skill. And I have lots of learning left to do. It’s hard to imagine operators doing as many as 1,200 pickups in a day. It took me about three minutes – okay, maybe five – to unload a single bin, meaning it would take me about 100 hours to do what some pros do in a day. In right-hand standup configured LR trucks, the operator can be in and out of the truck hundreds of times a day, so Mack has made entry and egress as easy as possible. There’s a short 16-inch step from the ground to the first step. “Our ground to floor height is the lowest in the industry among major manufacturers,” Dorwart claimed. After finally dumping the imaginary contents of a blue bin into the box, we set out for the Allentown subdivisions near the Mack Customer Center. As luck would have it, it was garbage day. With so many bins and trash cans set out for collection, I realized the width of a cul de sac and the turning radius required to navigate it is seriously compromised. Sometimes, backing is necessary, even with the LR’s impressively tight turning. This is where collection companies and municipalities get nervous – and rightfully so. I can’t think of another segment of the trucking industry in which the vehicles operate in such close proximity to citizens. It takes only a second for a kid on a bike to dart out behind a reversing trash truck. As soon as I put the LR in reverse, the ceiling-mounted monitor inside the cab switched from the view of the inside of the body to one of what was behind the truck. It was comforting to see a clear view of the area immediately behind the truck. How can you order a refuse truck without installing cameras? 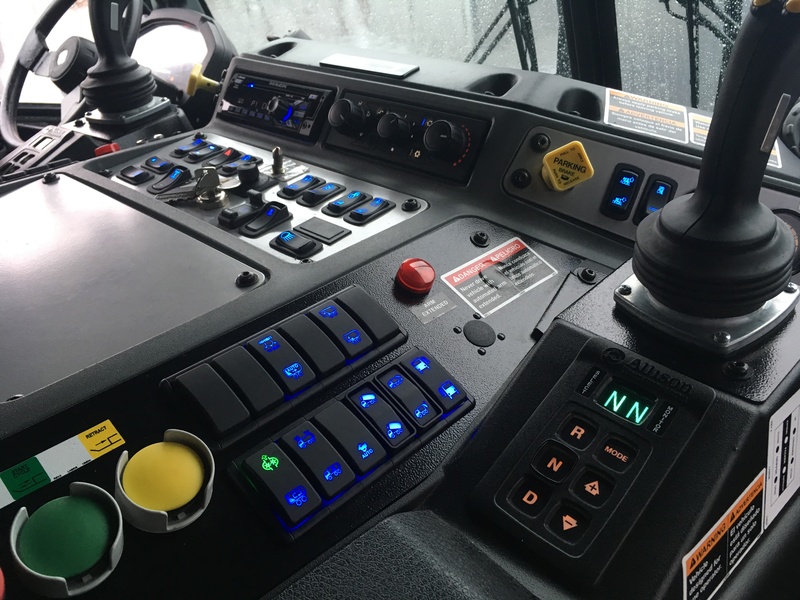 When operating the LR from the right-hand driving position, the controls on that side of the cab light up. Another nice improvement built into the LR is the B-pillar wraparound glass on both rear corners of the cab. I glanced through these new windows frequently, especially at intersections or when changing lanes out on the highway. I took the truck for a lengthy jaunt along the highway to get a feel for its on-road handling. It’s a wide truck, which takes some getting used to, but it rode well considering it was empty. Power was more than sufficient. This truck featured the Mack MP7-345R engine, designed for this application. That engine is being replaced with a new MP7-355A, which will produce 10 additional horsepower and the same 1,280 lb.-ft. of torque. The transmission was an Allison 4500 RDS six-speed. Mack doesn’t offer its proprietary mDrive automated manual in this vehicle, because this is an application where the Allison really shines, Dorwart said. In addition to being a safer, more comfortable truck to operate than its predecessor, attention has also been spent on making it more user-friendly for body builders. That’s not simple, since there are so many body builders playing in this space. “It’s very important to get trucks through the body upfit process as quickly as possible,” Dorwart explained. Mack provides convenient wiring channels for upfitters and an additional wiring channel that runs up the middle of the windshield for easy installation of a camera system. Fuses are easily accessed via the top of the dash. Design improvements, such as flush lighting and corner guards, protect the most breakable items on the truck from damage. 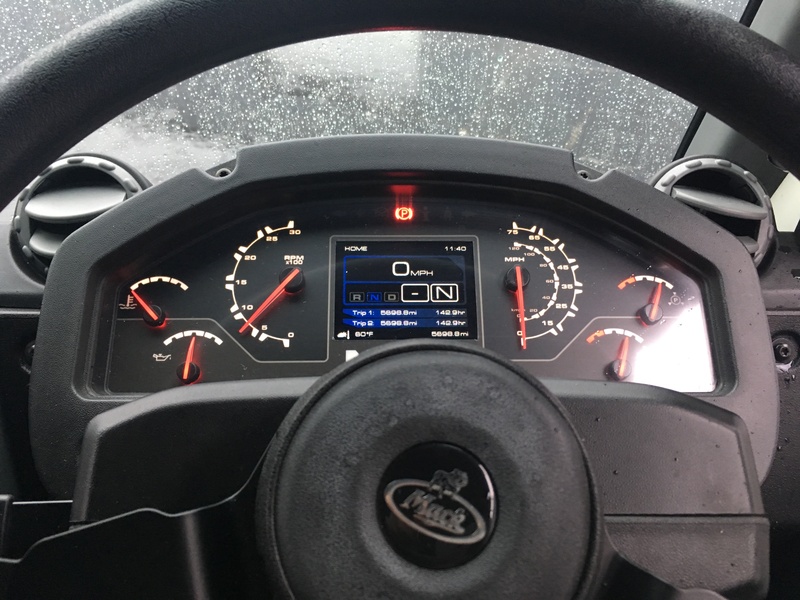 Mack announced recently that it is extending its GuardDog Connect telematics platform to the LR model. It monitors fault codes and then sends them to Mack’s OneCall service center for analysis. From there, the fleet manager is advised on the best course of action. They can even be directed to the nearest dealership with the required parts in stock. Telematics has established a devout following – and proven its worth – in the on-highway segment, but do its benefits exist even in applications where the truck returns home every night? He noted GuardDog Connect will be especially beneficial to customers who are seeing more than a single digit percentage of their total maintenance costs spent on unscheduled maintenance. “If you’re pushing more than that, a system like this can be an even greater help to you, to give you a head’s up if something is going south,” he said. It’s offered as standard, free of charge, on all new LR trucks for a period of two years. The LR brings to the refuse segment several safety enhancements and previously unavailable creature comforts that drivers in other segments take for granted. The LR is a more refined vehicle than what many trash collectors have been accustomed to. And just because the stuff you haul may stink, doesn’t mean your ride has to.